Reading and share top 26 famous quotes and sayings about Sausages by famous authors and people. 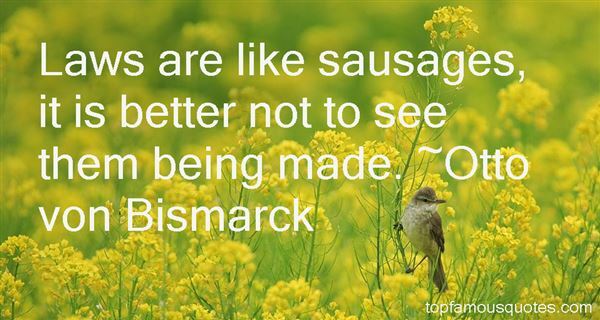 Browse top 26 famous quotes and sayings about Sausages by most favorite authors. 1. 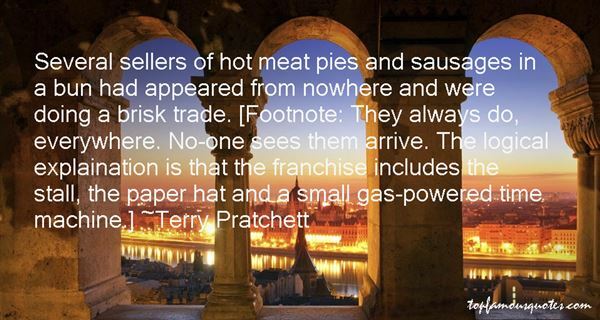 "Profits, like sausages... are esteemed most by those who know least about what goes into them." 2. "Listen, boy, just ask the chef to make me a proper Full English Breakfast.You know, bacon, fried eggs, sausages, liver, grilled mushrooms and tomatoes, black pudding, kidneys, baked beans, fried bread, toast and served with strong English mustard, mind - none of this effete French muck - and a large mug of hot, strong Indian tea." 3. 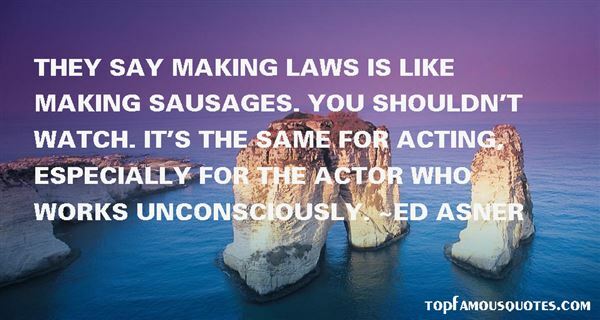 "They say making laws is like making sausages. You shouldn't watch. It's the same for acting, especially for the actor who works unconsciously." 4. "I am sorry to have to introduce the subject of Christmas. It is an indecent subject; a cruel, gluttonous subject; a drunken, disorderly subject; a wasteful, disastrous subject; a wicked, cadging, lying, filthy, blasphemous and demoralizing subject. Christmas is forced on a reluctant and disgusted nation by the shopkeepers and the press: on its own merits it would wither and shrivel in the fiery breath of universal hatred; and anyone who looked back to it would be turned into a pillar of greasy sausages." 5. "Peddlers were selling dog sausages, roast onions, and unborn puppies on a stick,"
6. "The banquet proceeded. The first course, a mince of olives, shrimp and onions baked in oyster shells with cheese and parsley was followed by a soup of tunny, cockles and winkles simmered in white wine with leeks and dill. Then, in order, came a service of broiled quail stuffed with morels, served on slices of good white bread, with side dishes of green peas; artichokes cooked in wine and butter, with a salad of garden greens; then tripes and sausages with pickled cabbage; then a noble saddle of venison glazed with cherry sauce and served with barley first simmered in broth, then fried with garlic and sage; then honey-cakes, nuts and oranges; and all the while the goblets flowed full with noble Voluspa and San Sue from Watershade, along with the tart green muscat wine of Dascinet." 7. "My first outdoor cooking memories are full of erratic British summers, Dad swearing at a barbecue that he couldn't put together, and eventually eating charred sausages, feeling brilliant." 8. "I make love like I sell sausages to strange women. One at a time, and always covered with a condom (to keep the flies away)." 9. "I wore a groove in the kitchen floor with endless trips to the fridge, hoping against hope that I had somehow missed a plateful of cold sausages on the previous 4,000 excursions. Then, for no obvious reason, I decided to buy a footstool." 10. "Never chain your dogs together with sausages. One must accustom one's self to be bored." 11. "The true heart of Carolyn's farm was her kitchen, where sausages and pungent dog treats lay scattered over they counters, along with collars, magazines and books, trial application forums, checks from her students (Carolyn, not big on details, often left them lying around for months), leashes, and dog toys. Pots of coffee were always brewing, and dog people could be found sitting around her big wooden table at all hours. Devon and I were always welcome there, and he grew to love going around the table from person to person, collecting pats and treats. Troubled dogs were familiar at the table, and appreciated. If we couldn't bring our dogs many places, we could always bring them here." 12. "Is your head bothering you?" Louisa asked. But she wasn't paying much attention. Frederick, her ridiculously fat basset hounds, had spotted a fellow canine in the distance and was yanking on the lead. "Frederick!" she yelped, tripping on a step or two before she found her footing.Frederick stopped, althought it wasn't clear if it was due to Louisa's hold on the lead or outright exhaustion. He let out a hugh sigh, and frankly, Annabel was suprised that he didn't collapse on the ground. "I think someone has been sneaking him sausages again," Louisa grumbled.Annabel looked elsewhere."Annabel! ""He looked so HUNGERY," Annabel insisted.Louisa motioned toward her dog, whos belly slid along the grass. "THAT looks hungery? ""His eyes looked hungery." 13. " Oberon said from behind the counter.I busied myself making Emily's tea and spoke to him through our link. 'Yes, well, she's decided to take the high road, so I'll be happy to walk it with her as long as she likes.''Nope. She's a witch. A polite witch, but still a witch. She's got a charm on her hair that would have had me giving her anything she wanted if I hadn't been wearing protection. Don't take anything from her, by the way. ''Oh yes she does. Emily has probably already told her. ''How would you know the difference if she did? You think all sausages are magic." 14. "We came from a family where we ran our own small business. Our dad made his own products. We made our own sausages, our own meatloafs, our own pickles. Dad had to do everything himself. He had to figure out how to finance his business." 15. "Preparing the communal evening meal sometimes caused arguments. Every village in Sicily had a different recipe for squid and eels, disagreed on what herbs should be disbarred from the tomato sauce. And whether sausages should ever be baked." 16. "The nauseating liquid choked the dog's breathing and his head began to spin, then his legs collapsed and he seemed to be moving sideways. This is it, he thought dreamily as he collapsed on to the sharp slivers of glass. Goodbye, Moscow! I shan't see Chichkin or the proletarians or Cracow sausages again. I'm going to the heaven for long-suffering dogs. You butchers – why did you have to do this to me? With that he finally collapsed on to his back and passed out." Chapter 2"
17. "I recently went to New York for the first time, and honey, I'm in love with that place. I'm obsessed with its sausages." 18. "To retain respect for sausages and laws, one must not watch them in the making." 19. "Laws are like sausages, it is better not to see them being made." 20. "Whoever would have guessed that in the land of cheap sausages and mashed potatoes there could be such a change which would actually bring the French from Paris every weekend to invade Britain en masse to eat great food and drink great wine." 21. "My yogurt was nestled into a bag, waiting to turn into aushak, and all around us were sausages and pastry, lollipops and spices, chicken and cheese. Any world that contained all this, I thought surveying our loot, was a very fine place. I felt reinvigorated, alive, optimistic. The though of getting back to work suddenly seemed like fun." 22. "You should see my corgis at sunset in the snow. It's their finest hour. About five o'clock they glow like copper. Then they come in and lie in front of the fire like a string of sausages." 23. "Mr Dibbler can even sell sausages to people that have bought them off him before … And a man who could sell Mr Dibbler's sausages twice could sell anything"
24. "Several sellers of hot meat pies and sausages in a bun had appeared from nowhere and were doing a brisk trade. [Footnote: They always do, everywhere. No-one sees them arrive. The logical explaination is that the franchise includes the stall, the paper hat and a small gas-powered time machine.]" 25. "I miss Irish milk. Probably not as much as Superquinn sausages." 26. "[Prince Humperdinck] was seventy-five minutes away from his first female murder, and he wondered if he could get his fingers to her throat before even the start of a scream. He had been practicing on giant sausages all the afternoon and had the movements down pretty pat, but then, giant sausages weren't necks and all the wishing in the world wouldn't make them so." Did perpetual happiness in the Garden of Eden maybe get so boring that eating the apple was justified?"